Robert Moses built the Prospect Expressway for a few million dollars in the 1950s, cutting a scar between Park Slope and Windsor Terrace. Now, Brooklyn Borough President Eric Adams is championing a plan to spend upwards of $100 million that to heal the wound. 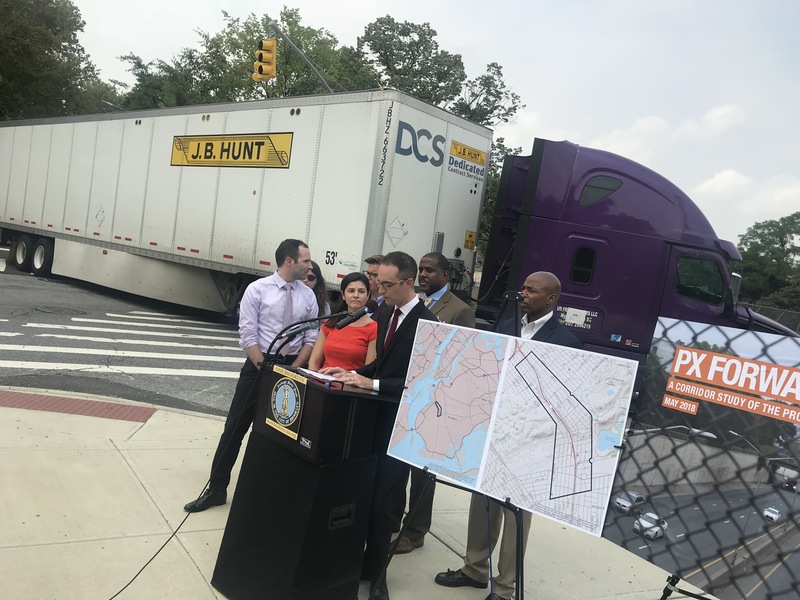 On Monday, Adams released “PX Forward,” a report [PDF] commissioned from NYU’s Wagner School of Public Service that called for transforming the mostly below-grade highway from a blighted trench to create space for new parks, new development and better transportation infrastructure. The 69-page report, written by NYU-Wagner graduate students, offers 11 recommendations. Some are quick fixes, such as altering light timings, re-routing trucks or adding a four-way stop at Seeley Place and 19th Street, while other mid-priced changes include closing some entrance ramps and opening new ones. But the big-ticket items include megaprojects such as decking the entire expressway or filling the trench to create an at-grade boulevard modeled on the Embarcadero in San Francisco or the West Side Highway below 57th Street in Manhattan. Another proposal calls for using some of the currently inaccessible shoulder space on the highway for public buildings such as libraries that can be accessed from the raised sidewalk. Covering over the two-mile below-grade portion of the highway would cost hundreds of millions of dollars, if other cities’ experience, and other proposals in New York, serve as a guide. New Jersey spent $150 million on a short deck over Route 29 to create “Riverwalk,” a park linking the city to the Delaware River. But the presence of the park led to a surge in local real estate values that partially offset the cost. Dallas before (left) and after a decking project downtown. Indeed, the only way to make decking work is apparently to have private developers involved from the state. “As in other cities, innovative partnerships between federal and local governments and private parties may present a unique funding opportunity,” admitted the PX Forward planners, echoing several prior studies. “The cost of decking could mean that either public subsidies or high densities would be needed in order to make such a project economically feasible,” the report continued. “As a result, privately built buildings constructed over transportation rights-of-way are often large and tall in order to minimize the cost of footings and decking and to provide sufficient revenue to justify the level of investment required. More recently, a 2016 proposal to deck over and beautify an even shorter below-grade portion of Brooklyn-Queens Expressway through Williamsburg was priced at $100 million. 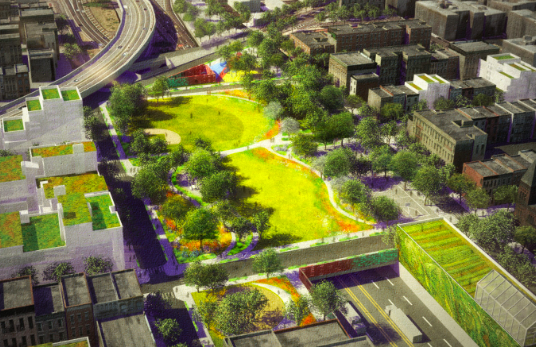 That proposal, called “BQGreen,” is still on a drawing board. Decking is so daunting that a 2010 study of the below-grade portion of the BQE between Atlantic Avenue and Summit Street through Carroll Gardens did not even address the possibility. Instead, the proposal offered piecemeal treatments such as planting more street trees, installing acoustic barriers, adding pedestrian bridges or even building a “Green Canopy” of vines and solar cells over the exposed highway. As a result, the proposals ranged from $10 million to $50 million. “Adding medians, traffic signals, dedicated bus lanes and pedestrian crossings would create a safe and attractive space for multiple modes of transportation,” the report added, citing examples such as Rochester and San Francisco’s torn-down Embarcadero Freeway, now a grand boulevard along the bay. One proposal calls for filling the Prospect Expressway trench and building an at-grade boulevard like this one. 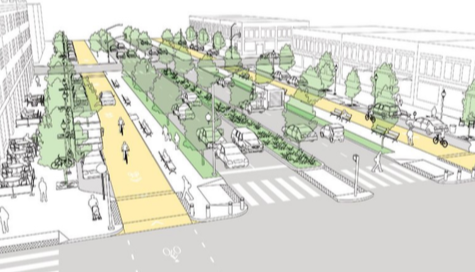 PX Forward’s boulevard plan hints that the expressway would retain at least two lanes for cars. On Monday’s unveiling of the study, Adams declined to say what plan he would push for, or how he would get state and local authorities to commit funding. “This study is a call to action,” he said.